Paint brushes (and roller) coming out of long term storage as Lounge gets a makeover this weekend. Have bought pizza oven like Peaky’s. Just finished trial run. Need to speed up on pizza prep - can’t make them and eat them fast enough to keep up. Many thanks for pizzas at the group weekend - it’s hard work! 13-14-15 July celebrating my birthday with friends, alcohol, and drag racing at Santa Pod Raceway. As has been just said, Congratulations on the retirement & i'm going to guess you all had a good time at the racing. Looking forward to the on-going project & the odd photo. 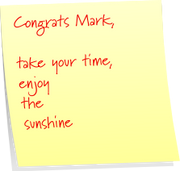 Well done Mark, enjoy the 'down time'.